M. Night Shyamalan's Glass is already looking pretty epic from the yesterday's teaser featuring James McAvoy's The Beast and today's new release featuring Bruce Willis' David Dunn. The full-length trailer for the film will be released this Friday at San Diego Comic-Con when the festivities are all well underway. Glass brings together the narratives of two of Shyamalan's standout originals-2000's Unbreakable and 2016's Split, in one brand-new comic-book thriller. Bruce Willis returns as David Dunn from Unbreakable as does Samuel L. Jackson as Elijah Price, known also by his pseudonym Mr. Glass. Glass will more than likely be getting his own teaser trailer tomorrow, if the studio follows the same promotional release schedule from the previous two days. Joining Jackson and Willis from Split is James McAvoy, who is reprising his role as Kevin Wendell Crumb and the multiple identities who reside within, as well as Anya Taylor-Joy as Casey Cooke, the only captive to survive an encounter with The Beast. 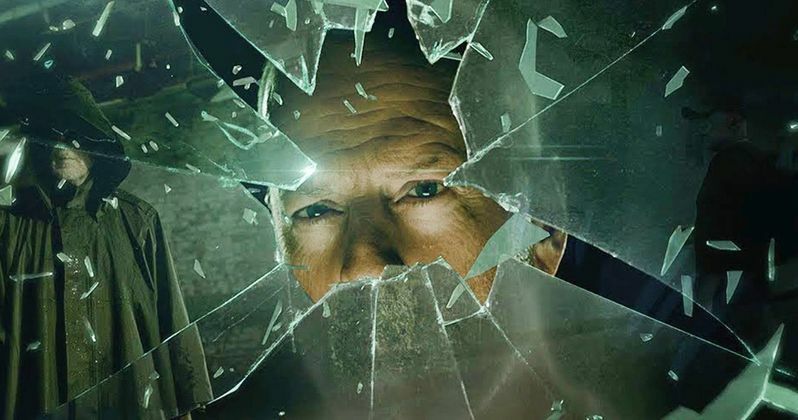 Following the surprise conclusion of Split, Mr. Glass finds David Dunn pursuing Kevin Wendell Crumb's superhuman figure of The Beast in a series of escalating encounters, while the shadowy presence of Samuel L. Jackson's Elijah Price emerges as an orchestrator who holds secrets critical to both men. M. Night Shyamalan fans had been waiting years to hear about a possible sequel to Unbreakable, and were shocked to learn that it was buried in the conclusion of 2016's Split. It was just the return to form that Shyamalan devotees had been hoping for. Joining the all-star cast of Split are Unbreakable's Spencer Treat Clark and Charlayne Woodard, who reprise their roles as Dunn's son and Price's mother, respectively. Golden Globe Award winner Sarah Paulson has also joined the cast as psychiatrist Dr. Ellie Staple. Glass was written and Directed by M. Night Shyamalan and produced by Shyamalan, Jason Blum, Marc Bienstock, Ashwin Rajan. The film is Executive Produced by Steven Schneider, Gary Barber, Roger Birnbaum, Kevin Frakes. Glass opens in theaters on January 18, 2019 and will be the riveting culmination of M. Night Shyamalan's worldwide blockbusters, all rolled into one explosive film. James McAvoy recently revealed that he had no idea that Split was connected to the world of Unbreakable at first. It wasn't until Shyamalan started to talk about the possibility of doing another film and bringing back Bruce Willis' David Dunn that it all clicked for McAvoy. The ending of Split was intense, but it began to turn into excitement when Willis appeared on the screen, uttering the name of Unbreakable's supervillain portrayed by Samuel L. Jackson, Mr. Glass. Since then, fans of Shyamalan have been overwhelmed with excitement to know that Split and Unbreakable take place in the same universe and that they're about to merge in a few short months. While we wait for the full-length trailer, you can watch the new teaser featuring Bruce Willis' David Dunn below, provided by the Universal Pictures YouTube account.